This is the first personal few minutes I've had since my arrival! I took a taxi out of Paris, first thing Wednesday, and I've been busy ever since... My journey out of Paris airport reminded me what an active airport CDG really is. The number of long white clouds (from the jet engines) that lined the sky was impressive. After our meetings, there are receptions, followed by dinners, followed by late nights with colleagues, followed by more meetings the next day. It will be a tough year and many companies are struggling. We are no exception, so it's important to agree on strategies. I took this picture, at the exact moment, when I finally realised the reason why taxi drivers in France love me so much. I'm in Sens, a small town south of Paris, and staying at a very basic hotel. I asked yesterday how long the laundry would take... remember it was Thursday yesterday.... The receptionist told me they could have it ready for Tuesday!! I leave tomorrow; and so does my laundry bag. What I can't complain about is the superb quality of food and, more importantly, coffee. The French know their food; and they know that they do. 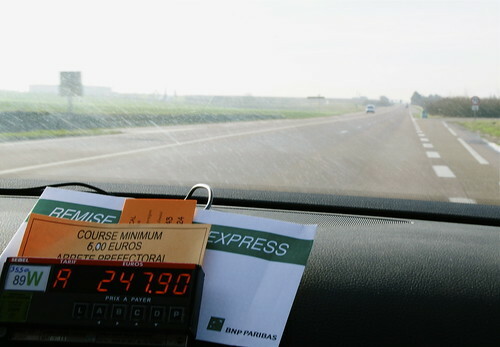 That taxi fare isn't in French francs, is it? It's Euros???? Holy Smokes, they must fight to drive you when they see you coming! I seriously need to go there. 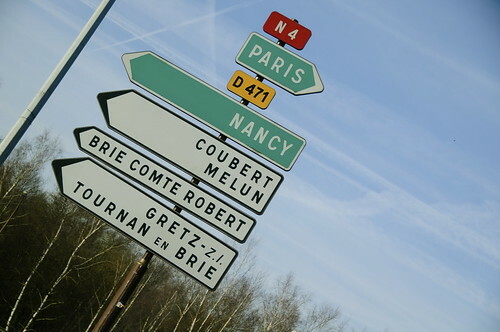 And all this while I was made to believe that Nancy lived in Paris! Thats a nice second pic! But I'm not that keen on French Food! France is interesting. Start with Paris. No :) Total opposites it seems. I don't drink - but this area, Bordeaux, is very famous for good white wine. Chablis is a beautiful little town. Not all French food - you're right. What I like is the effort that goes into every dish. Even at the smallest restaurant in the middle of nowhere. You can't fit us all on your bike... No Euros for you my friend.